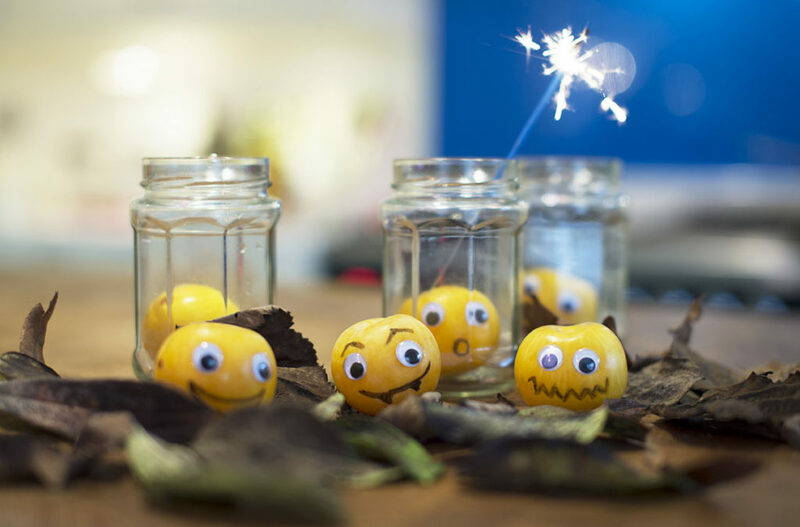 Whether you are looking for seasonal gift inspiration or spooky craft decorations, grab a few empty jam jars and let your creative pumpkin juices flow! Here are some ideas to give your home an extra-spooky feel this Halloween. Re-use your empty jam jars to make spellbinding party goody jars! Paint the lids and jars red. Draw a vampire head with a permanent black marker pen on to the jars and add your guests’ names on the lids. Fill with long-legged critters and other scary delights. Greet trick-or-treaters with a few eerily translucent ghosts. Wrap bandage around a jar using spray glue. Add self-adhesive googly black eyes and place a plastic tea light inside. Line up to your front door and scare the wits out of any trespassers. Apply black paper-maché on to jars to make creepy black cats and perfectly scary containers for Halloween treats. Give glass jars a spine-tingling makeover by painting them with an orange glass paint. Print enhanced photos of your family or guests in red or blue tones and glue to the jar. Place a plastic tea light inside to complete this frightfully festive talking point. Display a Halloween tree! After Christmas and Easter, why couldn’t Halloween have its own tree? Spray paint a few twigs in black and hang bewitching ornaments bearing the symbols of Halloween to give your home an extra-spooky feel. Treat partygoers to devilishly potent potions decanted into creepy-crawly glass jars. Serve graveyard cakes. Bake some Streamline Strawberry and Chocolate brownies and cut into round shapes to place at the bottom of each jar. Add chocolate sprinkles and some gummy worms for a deliciously spooky dessert. From felt fiends to sinister silhouettes, choose an assortment of geometric shapes that are easy to create freehand. Stick to the jars and use to hold party cutlery, paper napkins or Halloween lollipops! Have fun whilst turning your castle into a spooktacular scene this Halloween!